Vian Sora (Iraqi, born 1976), Ishtar. 2006 Mixed media on canvas, 43 3/8" x 43 3/8" (110 x 110 cm). BAGHDAD, IRAQ.- Iraq Museum International presents new work by Vian Sora, an Iraqi artist who challenges the forces that separate Mesopotamia yesterday from Iraq today. The solo online exhibition entitled, "Vian Sora: A Woman In Time," just went on view, and marks the beginning of an initiative in community cultural development that is unique in the world of archaeological studies. It is the first in a series at Iraq Museum International in which modern artists explore the cultural tragedies faced by Iraq since the fall of Baghdad in 2003. Lack of reconstruction funding for a cultural infrastructure in Iraq has led to cultural isolation, historical rootlessness, deteriorating community identity, erosion of cultural identity, destruction of human heritage, and lost knowledge. Driven by creative urgency, artists such as Sora are developing new strategies to address uncommunicated cultural heritage. Series curator John Simmons calls it, "Contemporary art at the service of humankind." 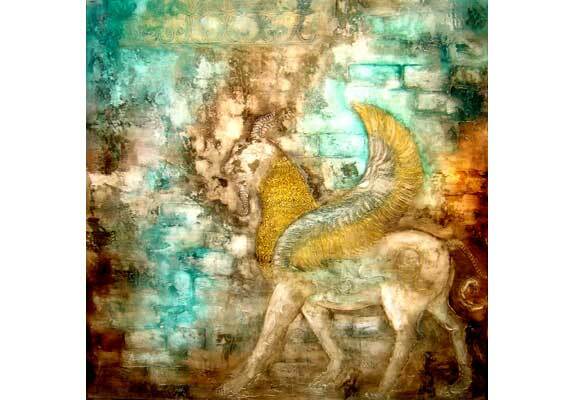 Iraqi expressionist painter Vian Sora was born in Baghdad in 1976. Prior to the war, she spent endless days at the Iraqi National Museum in Baghdad and at archaeological sites throughout Iraq. Her paintings in this exhibition bridge the ancient and modern Iraq by using a mixture of materials including solids and oils that creates a near-leather texture for engraving and coloring. She creates on canvas a present-day interpretation of the walls of long ago, on which were engraved the historical record of one civilization after another. To Sora, the history and heritage of Mesopotamia are now seemingly forgotten by those in distant lands, and she seeks to keep alive the colors, shapes, shadows and symbols of a culture that is critical for all humanity. She has recently exhibited at the French Cultural Center and the al-Wasity Gallery in Baghdad, as well as at Gallery Zamwa in Sulaimania, Iraqi Kurdistan, in a one-person show entitled, "Longing To Past." Since 2003, her work has found international audiences at the Topkapi Palace in Istanbul, the Japanese Cultural Center in Ankara, the Sharjah Art Festival in the U.A.E., and at Art Mondial in France. A tour of Vian Sora's work in the United States in 2007 has been proposed by Iraq Museum International.